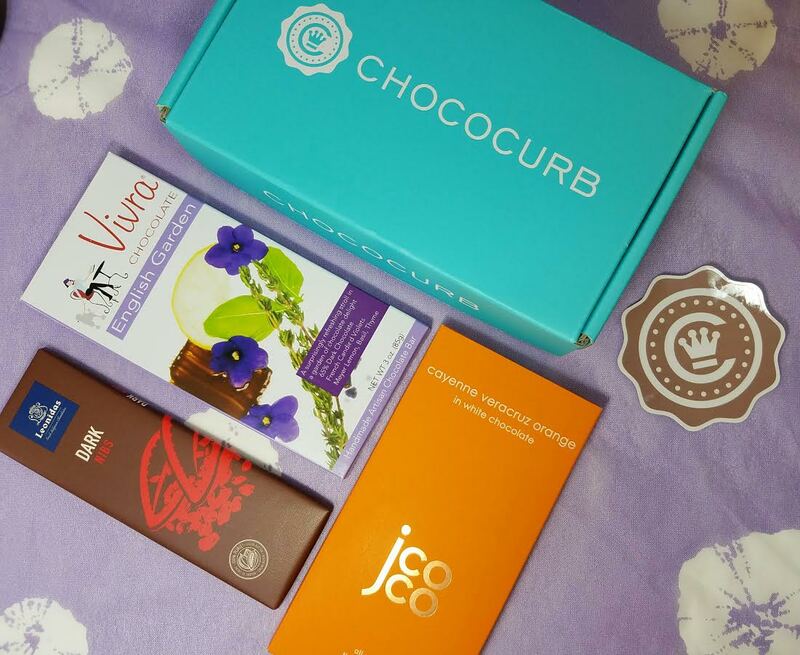 If you're looking for a subscription that's all about chocolate, Chococurb is perfect. I love the fact that you can customize it to your chocolate preferences but even more than that is how they send good chocolate. The bars I've received have been rich, decadent and creative. The majority of them have also been brand new to me, as well. It's hard to get hooked on so many delicious, hand crafted chocolates. There are three different sizes you can choose from now. There's the Nano, which is $10 and has five small to medium chocolates in it each month, the Mini which includes an assortment of 3 specialty chocolates and the Regular that's $35 with an assortment of 5 to 7 chocolates or chocolate related items. These items can come from small, local chocolatiers to more established, national brands. This review is for the Mini Chococurb box. 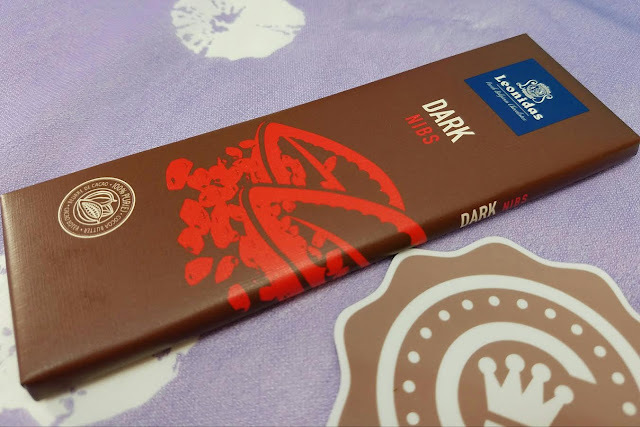 Leonidas Dark Nibs- It's always amazing to me just how different chocolate can taste. This is a smooth, creamy dark chocolate with roasted cocoa beans in it. It arrives in rather unassuming packaging but of all the bars I received, this was hands down my favorite. I really was not expecting that to be the case because I tried the Vivra first and loved it! The label says its 54% cocoa at a minimum but I think it must be more than that because I consider 54% to be milk chocolate (which I don't like). This is absolutely irresistible. Unfortunately. I just ate two squares and found out they're 145 calories each. Whoops. 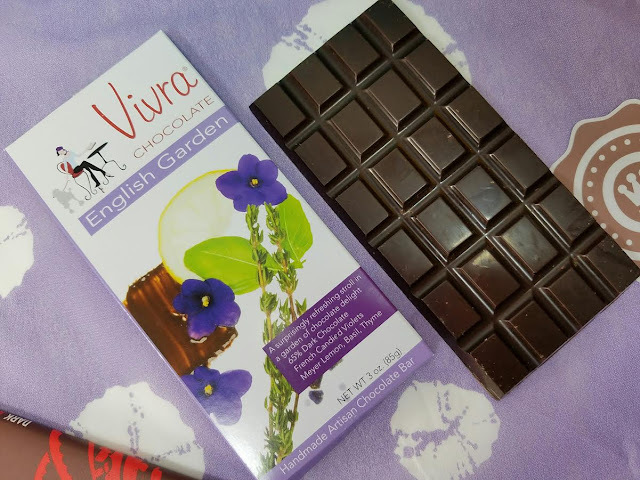 Vivra Chocolate English Garden- This gorgeous dark chocolate bar has candied violets, meyer lemon, basil and thyme in it. It's nice and dark (65%) and I feel like the lemon comes through most. It's delicious but I have to admit that the small scraps of candied violet get stuck in my teeth. Hm. 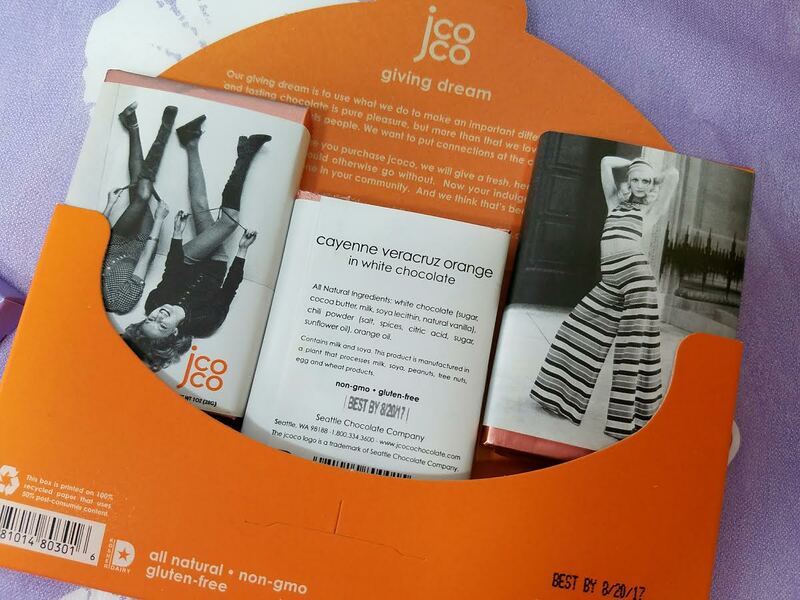 Jcoco Cayenne Veracruz Orange in White Chocolate- This appears to be made by the Seattle Chocolate Company. A fun offshoot with crazy flavors. This one is orange with cayenne. I don't particularly care for white chocolate but my mom loves it. I'm not sure if she loves spicy, though, and the label says it packs a punch. VERDICT: This is the perfect gift for a chocolate lover. It's always tasty and a fun way to get to know new chocolatiers and their brands. With the holidays coming up, keep it in mind. Just saying! If you would like to sign up for Chococurb, you can do that here. Use code BITSNBOXES10 for 10% off your first box. Would you gift someone chocolate? I had a boss who would have LOVED to get something like this! If it had been around back then, I totally would have done it. *This box was sent for review purposes. all opinions are mine.